Americans are witnessing the unfolding of the most egregious crimes committed against “We The People” breaches of national security in the name of treason and sedition by the former President of the United States Barack Obama and his “deep state’ henchmen. It is beyond human comprehension, the level of heinous crimes these people at the highest levels of government have committed against us behind our backs and now this information is becoming known through Patriots and Pro American organizations, Americans are demanding Justice and Accountability against the Traitors who manipulated the masses and the laws to complete their global take over. The conspiracy is, there is no conspiracy, only truth and facts. Those domestic enemy forces who have for years tricked the American people with their deceptive lies and plots to separate us by race, political affiliation and social class are now under the microscope and need to be punished by the full extent of the law. Be sure if they had the power they needed to finish off what they stared decades ago, we would be witnessing an apocalypse of the United States and the world. As wars were being waged in the sandbox’s of Iraq and Afghanistan, other secret arenas of global agendas were underway by private military forces separate and aside from our U.S. Military, without the Knowledge of Americans, while the deep state and their cronies waged war against the American population, adorning suits with smiles, spewing their famous lines of “there’s no there there”. Tom Fitton and Judicial Watch announced on Monday Oct 8 2018 that former President Barack Obama and the U.S. State Department were working hand in glove with George Soros operatives. Fitton stated the U.S. State Department spent $9 million in taxpayer dollars to fund Soros operations in Albania. How and why would the former President of the United States secretly partake in a rogue coup against America? Yet, there is strong evidence that Barack Obama aided and abetted this radical globalist George Soros. Enemy Soros has deeply penetrated and infiltrated himself into the U.S. Government, with his billions of dollars and camouflaged organizations to ambush the souls of sovereignty with a socialist agenda. 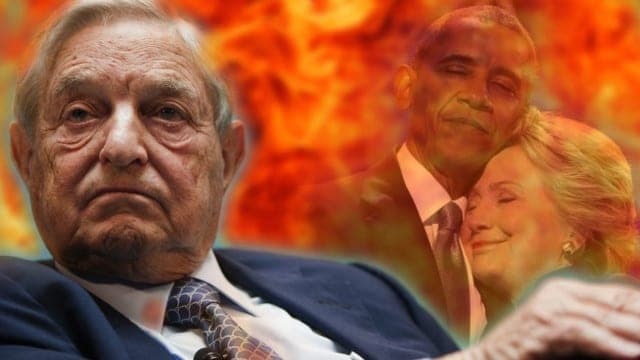 Soros, Obama and Hillary Clinton are the Shadow Party, they have undermined the US Constitution using political correctness as a tool to organize the democratic shadow party to help people support Socialism, Marxism and Communism. It was they who stated they wished to “rebuild” the Amendments to the Constitution, especially the First, Second and Fifth Amendments, the very ones that keep us free. These documents prove that USAID funds were funneled through that agency’s Civil Society Project to support Soros’s left wing Open Society Foundations in Albania, https://www.opensocietyfoundations.org/about, particularly the Soros operation efforts to provide the socialist government greater control of the judiciary. USAID reportedly gave $9 million in 2016 to the “Justice for All” campaign, which is overseen by Soros’s East West Management Institute. One Macedonian government official interview by Judicial Watch in Washington D.C. recently calls it “The Soros Infantry.” The groups organize youth movements, create influential media outlets and organize violent protests to undermine the institutions and policies implemented by the government. One of Soros groups funded the translation and publication of Saul Alinsky’s book, “Rules for Radicals”. into Macedonian. The book is a tactical manual of subversion, and provides direct advice for radical street protests and proclaims Lucifer to be the first radical. Let the FOIA suits proceed. It will be interesting to understate to see how deep the Democratic Party’s dug in with fueling Barack Obama era State Department and USAID funding to further a Soros-Alinsky message overseas. In addition to Albania, Judicial Watch also has filed FOIA lawsuits against the State Department and USAID for records about funding and political activities of George Soros’ Open Society Foundations in Macedonia, Romania and Columbia.